Cisco Virtual Wireless Controller, as its name described “Virtual”, is a controller in a virtual form factor. It enables flexible and cost-effective deployment for small, medium-sized, or large service provider deployments. Andit can be deployed on any x86 server that supports VMware ESXi 4.x, 5.x, or 6.x and Linux KVM systems. The Cisco Virtual Wireless LAN Controller (vWLC) is available with two types of software images starting with the 8.2 release: small-scale image (supports up to 200 access points and 6000 clients) and large-scale image (supports up to 3000 access points and 32,000 clients). In the following Part there are many fast questions and answers to help you know what the Cisco Virtual Wireless Controller is, know its capability and its bright features. Q. Does the Cisco Virtual Wireless Controller support local mode? A. The Cisco Virtual Wireless Controller offers FlexConnect features in both central and local switching. FlexConnect central switching provides a feature set similar to that of local mode. Q. Does the Cisco Virtual Wireless Controller support bring-your-own-device (BYOD) enhancements in conjunction with the Cisco Identity Services Engine (ISE)? A. Yes. The Cisco Virtual Wireless Controller with FlexConnect technology supports device registration, supplicant provisioning, and provisioning and onboarding of personal devices. Q. Does the Cisco Virtual Wireless Controller support context-aware services? A. Yes. The Cisco Virtual Wireless Controller supports Cisco Mobility Services Engine (MSE) integration for location tracking of Wi-Fi clients, RFID tags, wired and wireless clients, and rogue devices. Q. What security features does the Cisco Virtual Wireless Controller support? A. A comprehensive matrix for FlexConnect security support is at https://www.cisco.com/c/en/us/support/docs/wireless/5500-series-wireless-controllers/112042-technote-wlc-00.html . Q. 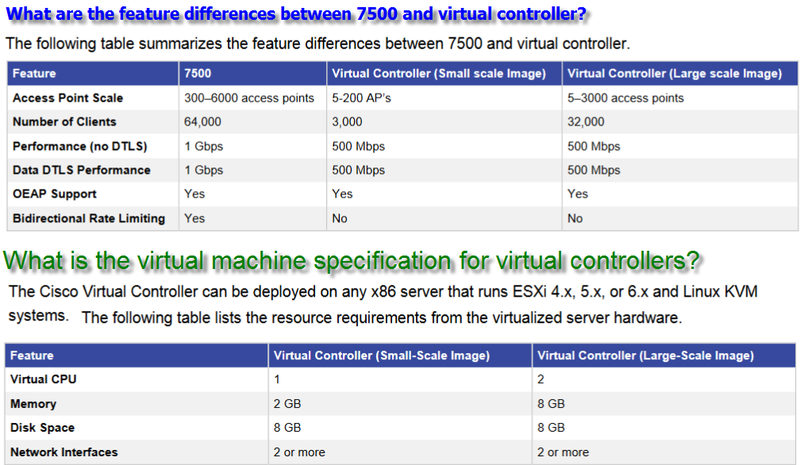 When do I position a Cisco Flex7500 Series Controller versus a Virtual Wireless Controller? Q. How is the Cisco Virtual Wireless Controller purchased? A. The Cisco Wireless Virtual Controller can be purchased directly from Cisco or from a reseller. After purchase of a license, a product activation key (PAK) is delivered to the purchaser. The PAK needs to be provided to a Cisco License Server along with a unique device identifier (that is generated when the virtual controller VM boots up) in order for the server to provide the virtual controller with a license file. The license file then needs to be installed in the virtual controller and activated. Q. What type of licensing does the virtual controller support? A. Cisco Virtual Wireless Controllers provide right-to-use (with end-user license agreement [EULA] acceptance) license enablement for faster time to deployment, with flexibility to add additional access points as business needs grow. Additional access point capacity licenses can be added over time. Right-to-use licensing (with EULA acceptance) for faster and easier license enablement. Starting with the 8.2 release, Cisco Virtual Wireless Controllers also provide an option to enable licensing using Cisco Smart Software Licensing, designed for easy monitoring and consumption of licenses. Manage license deployments with real-time visibility to ownership and consumption. Pools license entitlements in a single account. Licenses can be moved freely through the network to wherever they are needed. Q. How is the Cisco Virtual Wireless Controller deployed? A. The virtual controller software will be posted as a .ovf package in the Cisco software center. Customers can download the .ovf package and install it similarly to any other virtual application. Software comes with a free 60-day evaluation license. After the VM is started, the evaluation license can be activated, and later a purchased license can be automatically installed and activated. Q. How is the Cisco Virtual Controller managed? A. Similar to other Cisco Wireless Controllers, the virtual controller can be managed using the controller device GUI or using Cisco Prime infrastructure. Q. Does the Cisco Virtual Controller support serial console for out-of-band access? A. Yes. The administrator can use the vSphere client to configure the Cisco Virtual Controller. An alternate recommended option is to configure either a physical or virtual serial console. A physical console is bound to the physical ESXi server and can be connected to a terminal console server. A virtual serial port is accessible over the network and can be assigned to each virtual controller; more than one virtual serial console can be set up as required by the number of virtual controllers in each ESXi server. Only one console option (physical or virtual serial) can be used. Q. What are the requirements for access points to join a virtual controller? The access points must be upgraded to 7.3 software before joining a virtual controller. Access points ordered starting September 2012 shipped with 7.3 software from manufacturing. If the access points are associated with a controller, use the current upgrade process using Cisco Prime or controller to upgrade the access points to 7.3 software. Wanna choose a Cisco wireless controller for your needs? How to find out the right one? Here we go: The Smart Cisco Wireless Selector. Just answer a few simple questions to quickly identify the right Cisco wireless access points and controllers for you. Wanna know the specifications of different Cisco wireless controller at the same time? It’s easy to check. Use this tool to compare the specifications of Cisco wireless access points and controllers.